Cartel boss Joaquin “El Chapo” Guzmán, 61, was found guilty Tuesday of all 10 federal criminal accounts against him, including engaging in a continuing criminal enterprise, conspiracy to launder narcotics proceeds, international distribution of cocaine, heroin, marijuana and other drugs, and use of firearms. But the high-profile federal prosecution in New York is a largely symbolic victory for authorities in Mexico and the United States, where the cartel — based mostly in the Mexican state of Sinaloa — continues to control most major narcotics markets. 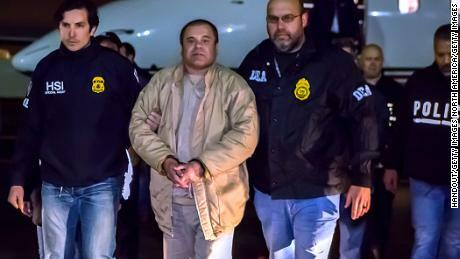 Guzmán, a founding father of the cartel named for his home state, was captured in Mexico in January 2016 and extradited to the United States a year later. But his criminal enterprise, which has long benefited from a more horizontal leadership structure he helped put in place, has continued to prosper, experts said. In his absence, the cartel’s day-to-day operations have been largely handled by Ismael “El Mayo” Zambada, a longtime associate of Guzmán’s. At trial, defense lawyers argued that Zambada — who was also named in the superseding indictment against Guzmán — bribed the Mexican government to frame El Chapo and remain free to run the cartel. “El Mayo Zambada and Sinaloa have continued and thrived and flourished,” said Bruce Bagley, a University of Miami expert on Mexico’s cartels who has followed the trial. The sensational 2½-month trial featured stunning testimony about corruption at nearly every echelon of Mexico’s government, from police and military commanders to local and state officials to former presidents who vehemently denied the allegations. That corruption did not end with Guzmán’s capture. It still greases the cartel’s successful operations. “It’s a confirmation of the massive widespread bribery and points to the difficulty the US government under (Presidents) George W. Bush, under (Barack) Obama and now (Donald) Trump have in finding workable partners,” Bagley said. Ray Donovan, the DEA special agent who spearheaded the 22-agency effort that led to Guzmán’s capture, told CNN that the Sinaloa cartel still supplies the vast majority of US drug markets. “In fact, Chapo’s sons are now risen through the ranks of the Sinaloa cartel and taken over Chapo’s end of the organization,” he said. Bagley said Guzmán and Zambada have allowed greater autonomy to an estimated 120 smaller cartel-affiliated organizations called “cartelitos.” That has made keeping track of them harder for law enforcement authorities. “It’s a symbolic victory,” he said of Guzmán’s prosecution. “It’s not going to affect the future of Sinaloa. The bottom line is that there are a lot of other people waiting in the wings. The jockeying has already begun. Zambada, in his 70s, is considered the last of the old-school Mexican drug capos. “He is very respected by the rank and file of the Sinaloa cartel and other cartel leaders,” said Vigil, who spent more than a dozen years working with the DEA in Mexico and along the border. And Sinaloa has a formidable rival. The Jalisco New Generation cartel has been one of the world’s fastest-growing drug organizations since its split from Guzmán’s group in 2010, according to a DEA assessment. Rubén Oseguera Cervantes, known as “El Mencho,” is its leader. Experts say the one certainly of Guzmán’s downfall is more drug violence. CNN’s Mark Morales contributed to this report.